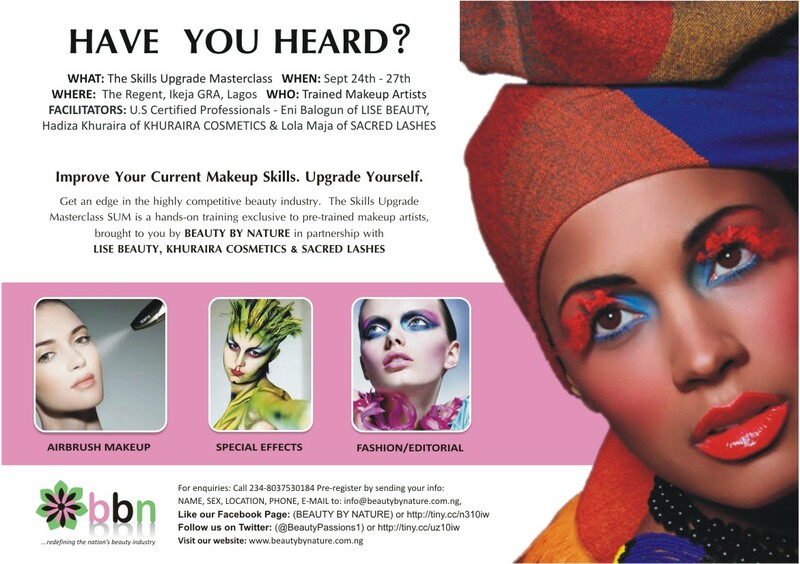 The SKILLS UPGRADE MASTERCLASS is a four day crash course specially designed for Savvy Makeup Artists who desire to improve on their skill set and gain an edge in the ever-competitive world of beauty by taking advantage of this highly intensive, practical and hands-on workshop. This training is strictly pre-registration. Thus, first 30 students to register (Friday September 7th) will get an invitation to attend the Hygiene & Safety Class facilitated by Gbemi Adebayo of Hegai & Esther and Anatomy & Physiology class facilitated by Lara on Day One. For more information on costs & location, check out the flier and note that there will be an early bird registration discount on class costs. I am pleased to announce that 4 people will be getting free passes to attend the Hygiene and Anatomy classes on the first day of the sessions. This is not tied to registration for the other 3 days master classes. All you have to do is comment on this post saying why you think you deserve to win a free pass to these classes. Please also include your email address. Winners will be chosen one week to the master class and will be contacted via email. There will always be a next time dear. Please don't feel bad. Cnt c d flier. Pls am interested. Hw much? Details pls. Tnk u so much! Hello, the flier is the image in the blog post. Website address, FB page, Twitter account and phone numbers are included. I would love to attend the free hygiene class as I am a practicing makeup artist and the importance of hygiene cannot be over emphasized in the Makeup industry.there is a need for awareness amongst fellow makeup artists and clients in order to deliver good services to our clients without them getting sick for the sake of beauty.my getting a free pass will enhance my hygience practices a whole lot and keep my clients sickness free. As an upcoming makeup artist,it would be a great pleasure to me if given an opportunity to attend a free hygiene/anatomy class reason been that due to the kind of service i render it is easy to pass infection from one client to another without even knowing it, i believe this class will sensitize me on the need to keep up with good hygiene process(s)and also profer solutions on how to combat, eliminate and carry out a germ free service and business as it were. It would also awaken my knowledge in another for me to be able to communicate and educate my clients and fellow clleagues on the need to exhibit excellent hygiene practices. That at the end we would be able to keep the makeup and beauty industry germ free. thanks and i look forward to attending the class. Attending the hygiene class will also help me to take high safety measures towards services renders to my clients,share the knowledge with my fellow colleagues who has little or no knowledge about its importance ,prevent our clients from having negative thoughts about makeup application will also to promote the art as a business and the makeup industry at large. I look forward to getting a positive response soonest.